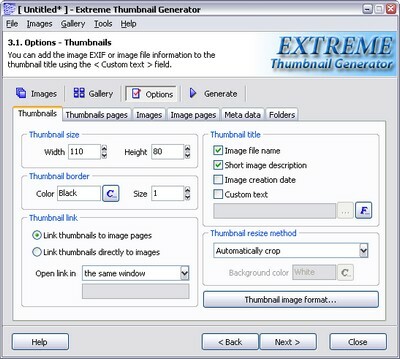 Extreme Thumbnail Generator allows you to link the thumbnail images in the gallery to image pages or directly to images (image files). The link to the image pages is a default option. If you want to link your thumbnails directly to image files then go to the Options step, Thumbnails tab and check the Link thumbnails directly to images box in the Thumbnail link section.